The present Kellas Stud was founded about 45 years ago with the purchase of a small chestnut in-foal filly, Chelone of Shergold. Most of my miniature chestnut ponies trace to her. Many are also descended from the chestnut 37" stallion, Brackla Flash Harry 62B, by Avening Coronaldo. Descendents of Harry and Chelone have been exported to many countries around the world. Three female lines were established from Chelones daughters. These daughters were Prima Donna of Kellas, by Brackla Flash Harry; Kellas Carmella, by Schore of Kellas; and Kellas Charisma by Bogs Golden Fire. Prima Donna Of Kellas Prima Donna produced the very successful mare, Kellas Pipette, by Schore of Kellas. Pipette has greatly influenced our miniature stock by giving us 2 excellent mares, Kellas Pipistrelle and Kellas Pirouette, and 2 of our miniature stallions, Kellas Pixie and Kellas Peerie Plover. The stud no longer exhibits at shows but these 2 stallions were shown as young-stock, being always well placed. 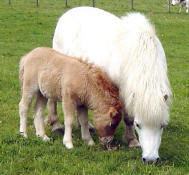 Plover was Junior Champion and Reserve Champion Miniature at the North of Scotland Shetland Pony Show as a foal. Two years later, at the same show, he was Reserve Junior Champion Coloured Shetland, the last time he was shown. Pixie was Reserve Junior Champion Miniature at the 1996 North of Scotland Shetland Pony Show. Kellas Pirouette with her cream chestnut dun filly, Kellas Pavlova, by Fieldbank Duncan. Pirouette is micro chipped & DNA identified. Kellas Carmella Kellas Carmella is the dam of our very successful little bay mare, Kellas Coral who is proving an excellent dam of showing stock, including Kellas Colette and Kellas Columbine, both good winners in the ring. Another promising youngster from Carmella, is Kellas Carmelita, a chestnut who is already a winner at her 1st show. Kellas Charisma Kellas Charisma is the dam of Kellas Charmion & Kellas Charina. Kellas Charinas 1st foal, Kellas Cloverhoney, was 1st in the Yearling Miniature Fillies at the North of Scotland Shetland Pony Show in 2000, her only outing. Our ponies are renowned for their particularly elegant heads, excellent temperaments, and hardiness. It is our policy now to microchip and DNA identify our best young mares.